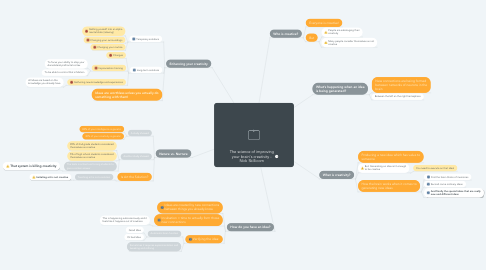 This mind map summarizes the key takeaways from the TEDx talk "The Science of Improving Your Brain's Creativity" by Nick Skillicorn. 1. What's happening when an idea is being generated? 3.2.1. You need to execute on that idea! 4. How do you have an idea? 5.3. Is Art the Solution? 6.3. Ideas are worthless unless you actually do something with them!